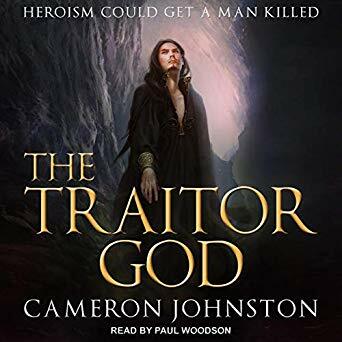 The Traitor God is coming to audiobook on December 4th and pre-orders are now up. "The first rays of the summer solstice struck the spires of the fabled Mirror Tower, causing golden dawn light to ripple through the crystalline walls, scattering points of light, starbright, all across the nave. Cara stared in awe, nausea forgotten. The cathedral vibrated underfoot as priests and dignitaries lifted their voices in prayer. 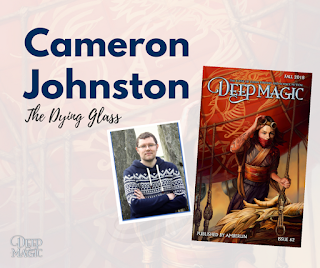 The Dying Glass by Cameron Johnston is an amazing story of glass, a mother's love, gods, demons, recorded history, and truth. What does fantasy worldbuilding and magical poop have in common? More than you might think. Hot on the heels of The Blitz of Din Barham being published, another short story will be coming out soon between the pages of Deep Magic. Look out for more details next week. My latest short story, The Blitz of Din Barham, has been published in Heroic Fantasy Quarterly #37. You want dragons? You want sorcerers? You want sorcerous in-fighting? Oh, you get it, in abundance! Din Barham is besieged by dragons, and the squabbling sorcerers are barely able to keep them at bay. Desperate times call for desperate measures and young Kyna, apprentice to the great Magus of Din Barham, has to break ranks and find a solution. I have no expectation I will actually win of course, but I'm delighted that something I wrote was liked by enough people to get it nominated, and that's a truly wondrous thing. Thank you all, whoever you gloriously amazing people are! 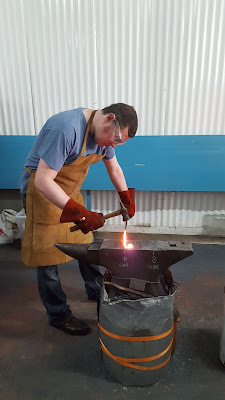 On Friday I took my first ever lesson in blacksmithing. Now that my arm can bend again I thought I would do a little write up of the experience, because it was a damn cool one that I would recommend to everybody. 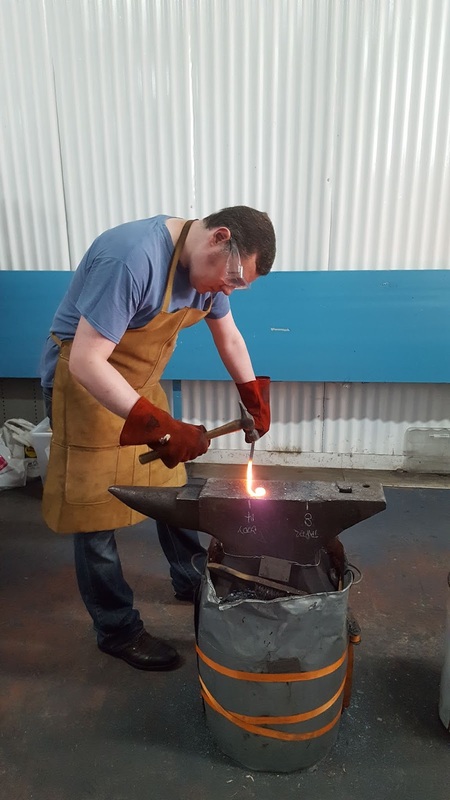 There's something hugely appealing and almost magical about heating and hammering red-hot metal into shape. 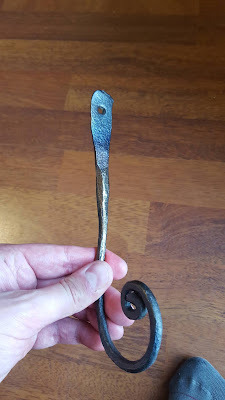 For the first project I was forging an iron coat hook from a long rod of metal. 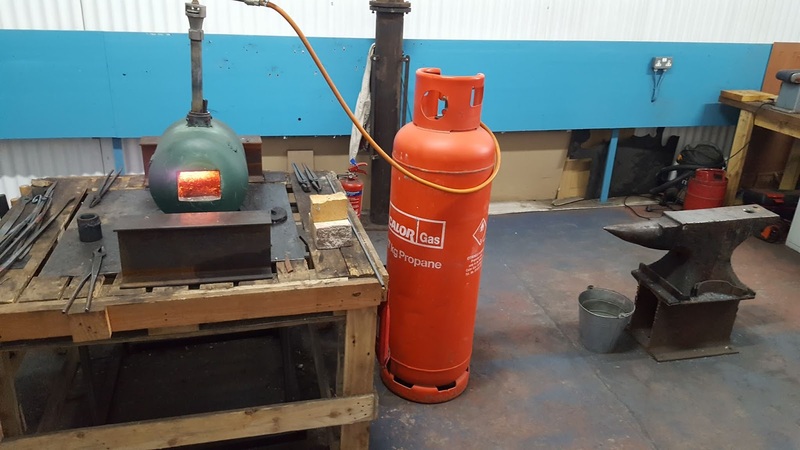 We were shown the forge (a small modern gas one rather than charcoal and bellows) all the various hammers, tongs and tools and the square rods of iron we were going to be beating into shape. The first step was getting a feel for the metal and the hammers and begin drawing the iron out (making it longer and thinner). We heated the iron until it was a hot and glorious yellow and then placed the end on the anvil, hammering it five times on one side, rotating 90 degrees and then another five, alternating back and forth in order to keep the existing shape. Rinse and repeat until the the metal turned from yellow to red and faded back to black, then it was time to re-heat and do it all over again. Once I had it down to a thinner length of metal it was time to take off those square edges and make it round instead. More delicate work with a lighter hammer but it proved to involve just as much arm-work. Next it was time to curl the tip round into a decorative shape. Which was much harder than it looked, involving delicate taps with a hammer to draw it towards you, and some straightening wonky bits with tongs and hammering. Once that was done it was time to fashion the flat plate where we would be putting in the screw/nail hole. Mostly that involved a heavier hammer and beating merry hells out of it until it was flat enough. Then it was time to use a punch to make the hole and a chisel to hammer a line into the metal above the hole, so we could snap off the unused length of iron rod. Some grinding and cleaning up with power tools and the coat hook was a splendid silver colour. Then I decided to heat temper the iron to give it some lovely colour. Basically, to heat it up in the forge again, with different time and temperatures granting different oxide effects, going from deepening shades of gold through purple and blue and back to silver. At this point even a single extra second under intense heat can mean blue instead of gold - which you can hopefully see from the top and bottom and the slight golden colour in the centre. It was hard, hot and sweaty work, but oh so satisfying! My good friends at Angry Robot have announced the sequel to The Traitor God. Colour me excited with a proper party hat on! 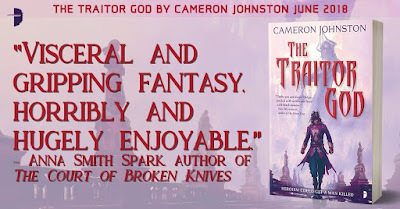 Tentatively titled, God of Broken Things, the novel will be dropping in June next year and sees your favourite antihero Edrin Walker back in the midst of all that terrible, beautiful action. 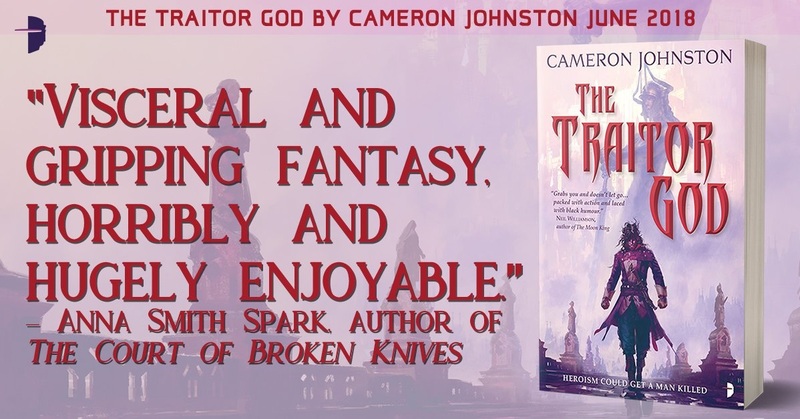 For those of you who’ve yet to have read The Traitor God, called this year’s best and most brutal grimdark (by Angry Robot no less! 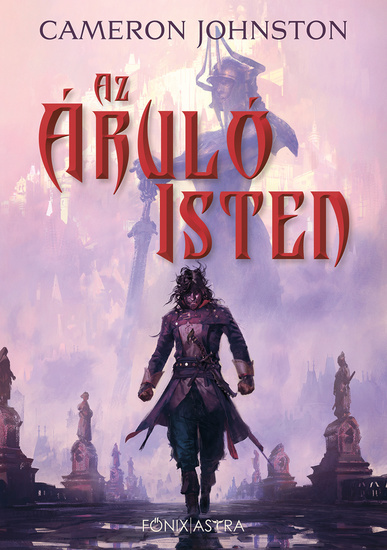 ), then you can get a sneak peek of the first chapter right here. 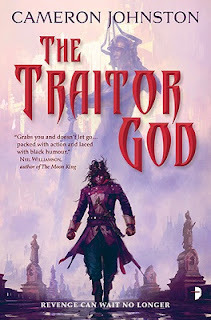 I've been asked a few times where the idea of the character of Edrin Walker and the city of Setharis came from - and here it is, the short story that spun off and exploded into becoming The Traitor God: Head Games has been reprinted in Mirror Dance. If you want to see a slightly earlier version of Edrin Walker taking place before he went into exile, you should probably read this. 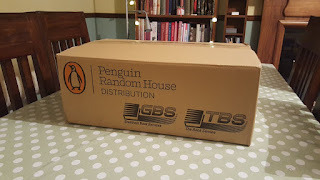 “When my book was published several people said they were going to borrow it through their local library – whoa, my book being in a library gives me all the feels. As a kid I spent so much in mine time picking out and reading armloads of books. It is a wonderful feeling that mine has now joined the others on those hallowed shelves. Now to wait for the incoming covers, which we’re sure will be totally kickass. You’ll see them here as soon as our optical orbs get to process them. The Traitor God has been unleashed upon the world! 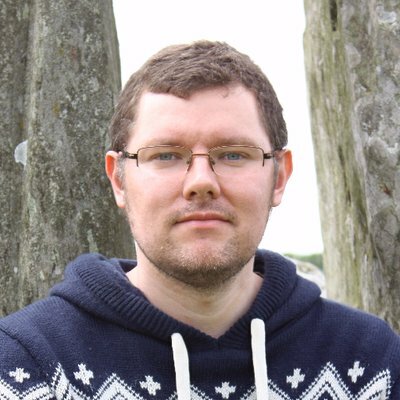 I answered cunning questions from Hippogriff's Aerie for my first ever interview as an author. Featuring: stop-motion skeletons, video nasties of the 80s, mysterious statues and the beauty of swords. Oh, and The Traitor God, better mention that too! 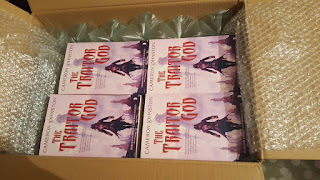 The Traitor God is now available for pre-order by all super-awesome people wanting to get their hands on it as soon as humanly possible in June. It is available dressed in your choice of handsome paperback or snazzy ebook attire! For us UK-types it's not available to pre-order on Amazon Kindle until March, but it IS for users of Amazon.com. Go figure, that's their KDP for you. Amazon UK - No UK Kindle pre-orders available until March. 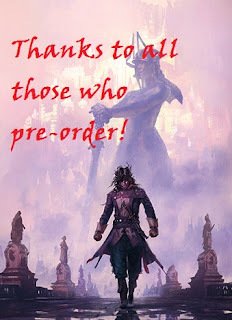 The wonderful author Brian McClellan has an excellent post on his website about why pre-orders matter.